So as the title says, although I find ‘New Year’s Resolutions’ silly which I said already, it would be hypocritical of me if I say I didn’t think of doing something to make my life better, where I’ll use the old fashion a-picture-says-a-thousand-words thing as given by this week’s photo challenge. The latest addition to my vast books collection is the (new edition) box set of the universally acclaimed A Song of Ice and Fire by George R.R. Martin, which is also adapted into the most amazing tv series run on HBO and the best thing on tv (and my most favourite) I spent nearly 2 hours cleaning my entire house just to make some space for this. You can see a lot of Batman and few others in this section too. As I said in my weekly writing challenge post I want to get back into reading more. What happened now? The Internet that is. Although my indulgence in too many things apart from these two also is, but that is not really a bad thing right? Time to get back into avid reading as I once was and also a balance in life. This entry was posted in Uncategorized and tagged A Song of Ice and Fire, Batman, books, Game of Thrones, photo, postaday, reading, weekly challenge by The Nameless One. Bookmark the permalink. 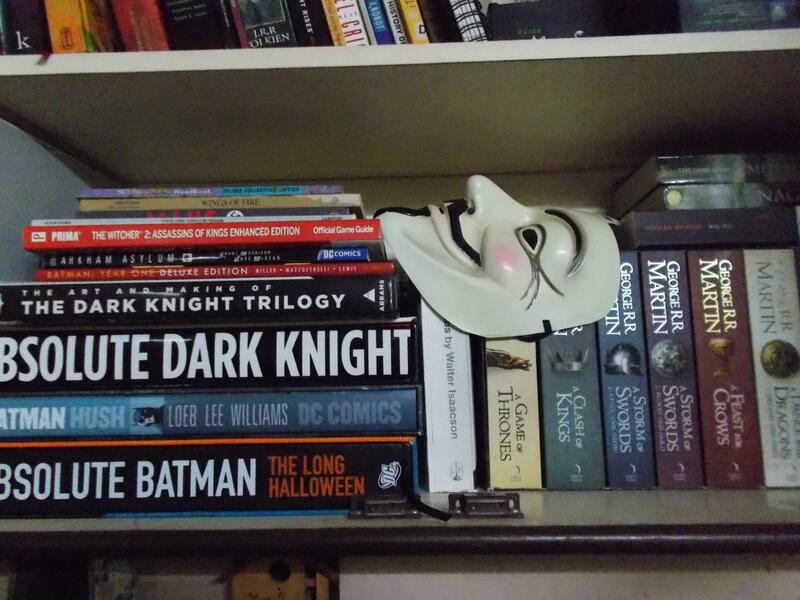 Damn I want that Guy fawkes mask now! Great blog ..kudos to you.